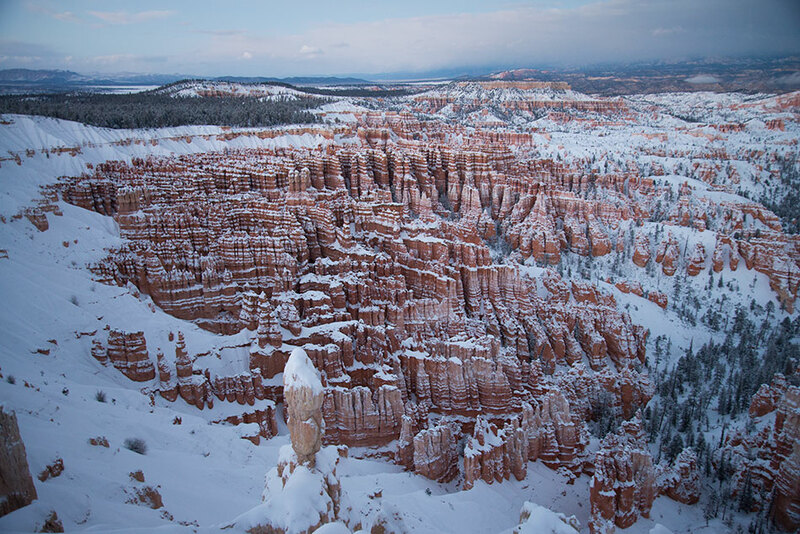 We were returning from California through southern Utah in February in a snowstorm when Forrest said to me, “Let’s go for a hike in Bryce Canyon." Bryce Canyon National Park is known for its stunning vistas of orange rock formations along the eastern side of the Paunsaugunt Plateau in southern Utah. But it was socked in that day. We could barely see the side of the road through the snow. At best, this was going to be a bust, I thought as I donned coat, hat and gloves. At worst, we would tramp down among the rock formations until we got stuck in a snowbank and froze to death. 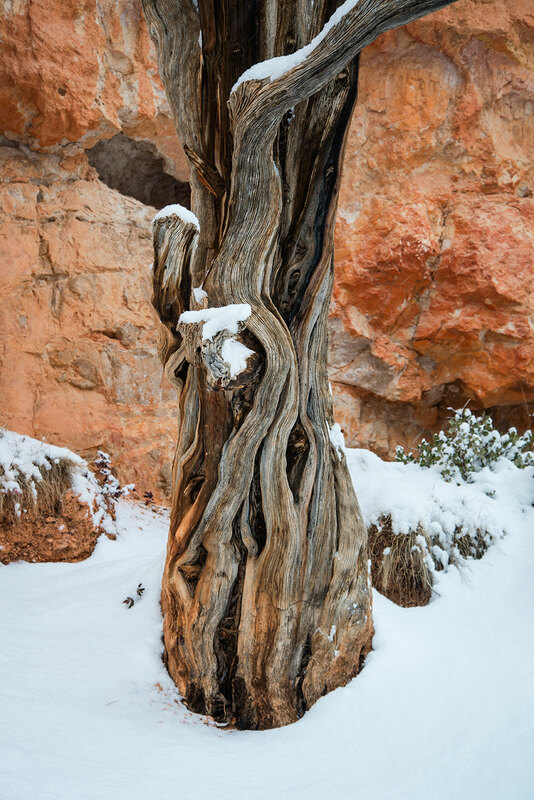 I was totally unprepared for the wonderland of snow-laden trees, glowing arches and natural rock sculptures that we discovered on this amazing winter adventure. At the end of a magical hike through falling snow and arches, we emerged at the top of the plateau just as the snow stopped and the fog lifted. We were treated to a spectacular panorama of clouds swirling around the rock formations. We returned in the spring of the next year and photographed the canyon and its surrounding area again. This time, the sky was a clear blue, and the rocks were equally magical but totally different. The park is truly an adventure for all seasons - and all times of day. 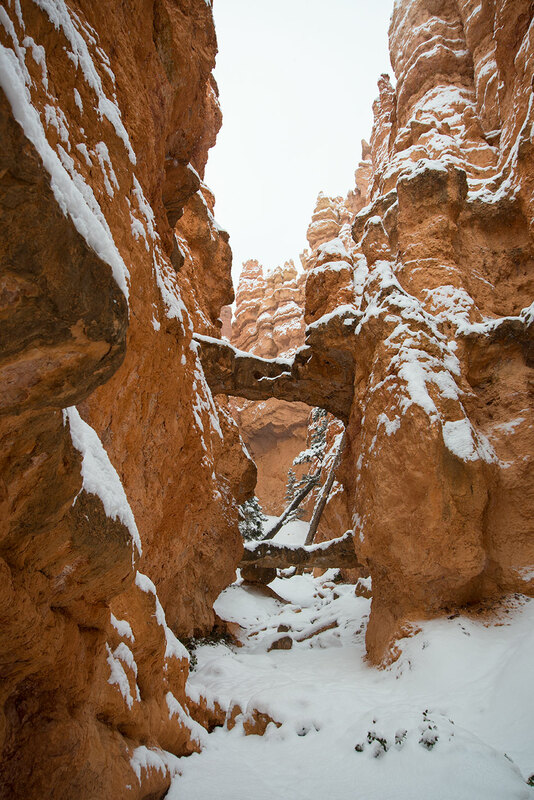 So don't put away your hiking boots for the winter yet - here are some of the scenes you can look forward to in the winter at Bryce Canyon. The park is about 50 miles northeast of the more popular Zion National Park in the Colorado Plateau area along the southeastern edge of the Paunsaugunt Plateau. Its castle-like formations were formed by erosion that exposed the colorful pinnacles called hoodoos. The erosion created arches, natural bridges and walls. The park has 13 viewpoints connected in a scenic drive, in addition to eight day trails and two overnight ones that require a backcountry camping permit, horse riding areas, skiing trails and two campgrounds. There is also a lodge.